Prepare to marvel at the architecture and lacquered facade of ornate buildings, in the glorified regal town of Pushkar, Rajasthan. With its rich cultural background and heritage, Pushkar is home to some of the best examples of the Rajasthani architecture, which are all bathed in a nostalgic shades of history. Pushkar is a revered pilgrimage hotspot as it is believed to attain salvation one has to visit the town. 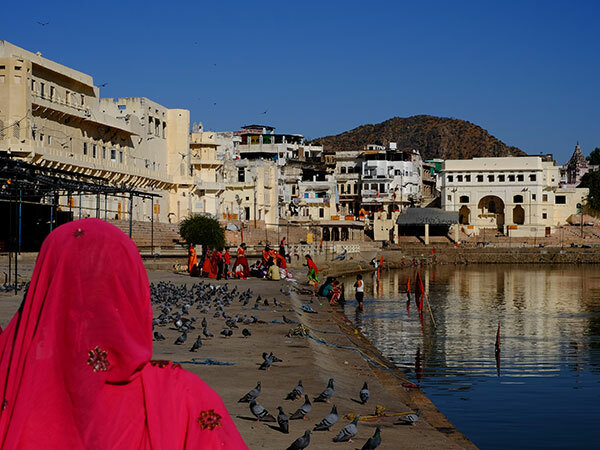 Pushkar puts you in a time warp with that timeless old world charm of the synthesis of Rajput and Mughal histories, and here is a list of must-visits when in town. By Air: The closest airport to reach Pushkar, is the Sanganer Airport located at Jaipur, which is about 146 km from this historical town. By Rail: The Ajmer Railway Station, located at a distance of 11 km from the town, is the nearest rail base to reach Pushkar. The station is well-connected by frequent trains from various major rail routes of the country. By Road: Pushkar is well connected to other major cities of India via regular buses. Regular buses are available from its bus terminus, the Pushkar Bus Junction, which is located in the heart of the town. The best time to visit Pushkar would be in the winter months of November to February, where the temperature is pleasantly moderate, ranging from an average of 15°C to 18°C. When in Pushkar, you must visit the Pushkar Lake, the pristine lake, that resides at the heart of the town. The lake and its surroundings look surreal and right out of a picture postcard. Sprawling over an area of over 22 sq km, the lake is flanked by over 400 temples and 52 palaces, the natural splendour of this spellbinding lake is sure to leave you awestruck. Stories have it, that taking a dip in the sacred lake is so holy that it is equivalent of performing meditation and prayer for a hundred years. The Brahma Temple is a major crowd-puller for its architectural brilliance and how breathtaking a view it offers of the mesmerising Pushkar Lake. Sanctified to the Hindu mythological deity, Lord Brahma, the temple is one among the three temples all over the world and the only one in India which is devoted to Him. With intricate details crafted and curated carefully in the carvings of the interiors, the temple is very peaceful with fresh cool breeze swaying you away from the adjacent lake. With eye-catching details carved out in the marble interiors, the temple stands tall overlooking the majestic town of Pushkar. Check out the remaining fragments of architectural magnificence scattered in the name of the great Man Mahal, in Pushkar. Nestled on the eastern bank of Sarovar Lake, the history of the palace dates back to centuries and its one-of-a-kind Rajasthani architecture are at par with the architectural grandeur and brilliance of the several significant Hindu temples that dot the town. Pushkar is also famous for the Rangji Temple which stands as an epitome of architectural brilliance. The temple is dedicated to Lord Vishnu, incarnated as Lord Rangji, and is always flooded with worshippers and devotees from all around the world. The engravings etched on the walls of the temple whispers of more than a 1000- year- old history and heritage. This sacred temple is one of the most spiritual sites and a revered pilgrimages in Pushkar. The sacred temple of Apteshwar makes for one of the most spiritual sites in Pushkar. Boasting of a brilliant architectural finesse, the temple stands right next to the Brahma Temple inside a cave. The temple is of a remarkable religious significance and is sanctified to the Hindu deity of Lord Shiva. Replete with outstanding craftsmanship of the artistic sculptures adorning the walls and gateways, the Apteshwar Temple makes for one monumental marvel to look at.